Discussion in 'Showroom' started by AsuharaMoon, Jan 18, 2019. Due to some personal stuff, I haven't been able to improve the Light Dash more than planned, but I think it will be fine until the next major update I do. And before you ask "Where's the Homing Attack? ", just take note that almost everyone in the hacking scene agrees the technique is a big NO for classic Sonic games. So I made an exception here and brought the Drop Dash directly from Sonic Mania, in order to provide a bit of variety. NeoFusionBox, ProjectFM, AkumaYin and 3 others like this. 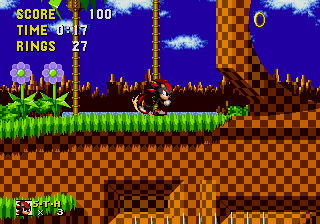 Back with another character swap hack I see, this time with Shadow, I do think this is the better Shadow in Sonic 1 hack. To start off the sprites for Shadow are really cool, I especially like the running animation which has Shadow skating but it's also mixed with the classic spinning feet effect. Onto gameplay, Shadow's moveset is well balanced, the drop dash is accurate to Mania which is nice (even though I prefer a Drop Dash without the 20 frame delay), the light dash is a nice implementation but has a few kinks mainly the speed you get from performing it being inconsistent and the fact that you can activate it while spin dashing which almost killed my 50 ring run in Spring Yard Act 2 near the end with the spike balls. I find it weird that you can't drop dash with B but I guess that's so I have an option to jump and avoid accidentally activating the drop dash. AkumaYin and AsuharaMoon like this. I really enjoy this. A complete character hack that has a complete sprite sheet, a robust moveset, and it makes Sonic 1 refreshing to play as. I love the inclusion of the lightdash (doesn't feel overpowered) and the non-inclusion of the homing attack (I really don't feel like it's needed here). Super Shadow also looks really cool, with his alternating palette and standard colours coming through. One thing I think you should make clear though; you need to be Super to use Chaos Blast. It's not obvious by your initial post. But, as soon as I realised this and used it, it works and I love the brief character palette flicker on Shadow too. Why on earth would you play without the extra option enabled? It's like the icing on the cake, and I love it. ProjectFM, HyaDoki and AsuharaMoon like this. Yea. Just Y E A. This is super well made and fun to play, but I've never been fond of specific actions being taken away from a button (can't jump with A) or locked to one button like the dropdash is. I can understand it, it's just hard to adjust to. Definitely something to shove on an everdrive when I get the time though. Seeing Super Shadow have a full set of sprites caught me completely off-guard, not to mention the All Of Me rendition, bravo! One thing I must say that REALLY bugged me was the W sprite, it looks so squashed and out-of-place, the Sonic 1 iOS remake has a W sprite you could use (I think for when it says Now Sonic can be Super Sonic.) Other than this, this seems like the BEST character hack/hack improvement of 2019! I definitely hope you do more Character Hack Improvements like how you did Tails and Knuckles in Sonic 1, not forgetting about the endless possibillities with the other characters yet to be in Sonic 1; there was a Ray in Sonic 1 hack many years ago IIRC, perhaps that hack needs the long overdue treatment? I'm sorry, what makes a Sonic 1 moveset "balanced"? This is a straight-up superset. S1 wasn't exactly made with having two insta-speed abilities in mind. There really isn't many options when it comes to modifying Sonic 1's moveset in a way that isn't overpowered. Sonic 1 Sonic only has the roll and the roll jump as abilities, which are moves that most Sonic characters have in their own games. If the moves don't remove most of the game's challenge then I'd say it's balanced enough. However, I would greatly like to see a new move that is more rarely used in 2D Sonic games and hacks. That way, characters hacks like this one will feel worth playing as I can see how the move can apply to certain situations. For example, JoenickROS' hack "Sonic 2 Return of Shadow" adds a multitude of original moves and mechanics for Shadow that, while buggy, are fun to use. This has the chaos spear, sure, but that requires getting all the chaos emeralds first. That's just my opinion and is probably too much to ask of a less experienced programmer, and I know a lot of the appeal of these hacks is the sprite-work. This one's art is extremely good, by the way. I love the new title screen animation. I'm just burnt out on playing this game in general and would like to experience it differently. Calvin and JoenickROS like this. Excellent work, my dude! 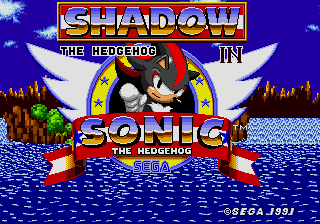 The art in this is so pristine and well-polished compared to the old Shadow hack. I'm so blown away by it!